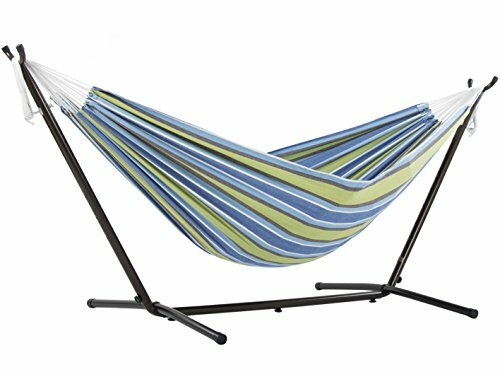 This is our best selling combination hammock and stand. The double hammock is made with 100-Percent cotton, creating a comfortable refuge for an afternoon snuggle. The space-saving 9-Foot stand is constructed of heavy duty steel and assembles in minutes without any tools. Plastic caps are used on the ends of the steel tubing to create a soft finish. With the included carrying case, you'll enjoy the freedom of setting up your hammock anywhere and no longer relying on those 2 perfect trees. The hammock bed is 63 x 94-Inch, with a total length of 130-Inch. Accommodates two adults. 450-Pound capacity.